You walk into the kitchen and smell something delicious. Odds are you can credit fresh, green herbs for that aromatic infusion. Sure, you can get the dried version in a jar, but fresh ones add more flavor and they’re easy to maintain – keep them in pots outside if you live in a temperate climate or start a windowsill garden if you live somewhere you experience extreme temperatures. 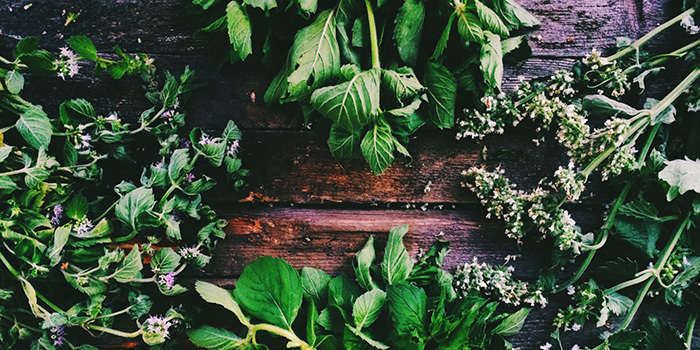 Here are seven herbs to start with that will make your recipes sing. Whether you pick the curly-leafed or the flat-leafed Italian variety, this herb has almost twice the carotenoid content of carrots. It is rich in antioxidants, which may slow down the effects of aging and help prevent coronary artery disease. Parsley also contains apigenin—a phytonutrient shown to potentially have anti-cancer properties, by working to inhibit the formation of new tumor-feeding blood cells. Recipe: Parsley is one of the stars that transform basic chicken breast into something special. Get the recipe. These delicate 1/4-inch leaves help cut cholesterol, reduce high blood sugar, promote detoxification of the blood, according to a study published in the Department of Food, Nutrition and Health. They are also a good source of vitamin A and vitamin C. Add chopped cilantro (and a squeeze of lime) to savory Mexican and Middle Eastern dishes. Recipe: Cilantro is an unexpected addition to this pork chop recipe, but it helps pull the other flavors together. These wide, pointed, round leaves are a good source of vitamin A and magnesium. They also contain iron, calcium, potassium, and vitamin C. Basil has anti-inflammatory and anti-bacterial properties that come from its high volatile (aromatic) oils content, which include—linalool, estragole, and limonene. Recipe: Add fresh basil leaves to any dish with whole-grain pasta or try this homemade basil pesto on an egg white omelet. A cousin of basil, these small, wrinkly leaves can soothes your tummy and can help lessen the effects of conditions like irritable bowel syndrome and dyspepsia, by its ability to relax the smooth muscles in these areas. Moroccan mint tea, anyone? Recipe: Mint gives this vegetarian chickpea salad extra zing. This pungent, slightly spicy herb is related to garlic and leeks. Like garlic, chives get their distinctive aroma from their high allicin content—an antioxidant compound that has been associated with anti-aging. Nutritionally, they’re a good source of beta-carotene, potassium, vitamin K, calcium, and folic acid, and also contain trace amounts of iron and vitamin B. Sprinkle chopped chives on top of soups and chive on. Recipe: Using chives in these broccoli and bell pepper egg cups will give them a depth of flavor they wouldn’t have otherwise. Dill, easily identifiable by its delicate, wispy fronds, is a nutritional powerhouse. It’s high in calcium, manganese, iron, fiber, and magnesium. And, like basil and mint, contains volatile oils such as limonene and anethofuran that have antioxidant properties. Ancient Greek and Roman soldiers would use burnt dill seeds on their wounds for healing, and while we don’t recommend that…we do support using it as a garnish for fish, in sauces, or if you make pickles! Recipe: Tzatziki, a dipping sauce made with yogurt, cucumbers, garlic, and dill, showcases dill’s flavor and is great on sandwiches. A staple of hundreds of cuisines from around the world, oregano’s fresh, fuzzy leaves add surprising dimension to beans and chicken dishes. It’s an excellent source of vitamin K, and a good source of vitamins A and C. It also contains iron, manganese, and folate. Try sprinkling minced leaves on slices of tomato and cucumber and drizzling a touch of olive oil on top for a Mediterranean-style snack. Recipe: Try this healthy turkey hash for breakfast. Just swap out the dried oregano for fresh. 1 teaspoon of dried leaves is equivalent to 1 tablespoon of fresh oregano. You are now provided free online access to most of your lab results when taken through LifeLabs. This will better prepare you for your visit with any physician and gives you seamless quick response to help track your health information in a secure, simple way. So whether your labs is requisitioned by your family doctor, your specialist or your naturopathic doctor, you may have your copy to take to your next appointment. This is very positive for all involved, as it provides faster and personal access to your own health records. Still, be sure to visit to your doctor with your results for the full interpretation. There is a danger in self-interpretation of results; even a doctor will see their doctor to get an objective opinion for their healthcare. Note also that LifeLabs has acquired CML, so watch for these same services to soon become available at CML laboratories. With all the great farmers markets around, why not stock up on the fresh greens and pack them into a wrap?